For some tragic, inexplicable reason, I grew up not knowing about trifles. Maybe they weren’t en vogue in New York in the ‘90s, or maybe their name belies their deliciousness and so they simply went ignored in my household. But trifles make a traditional appearance on my boyfriend’s Christmas table, and that is where I first encountered them. Needless to say, it was love at first taste. As far as I can tell, it generally involves cake, jam, whipped cream, and liquor. Do I need to elaborate here? The dessert is sweet but not sickeningly so, and it’s got a great fluffy soft texture that has a little more oomph than just pudding. Plus, it hides mistakes very well, since it’s supposed to all kind of meld together. It has an excellent fester factor: the cake soaks up the liquor and the whipped cream, and it keeps getting better and better in the fridge (I always look forward to storing my boyfriend’s Christmas leftovers for days, nibbling at it until it’s gone). Which makes it an ideal contender for a July 4th dessert: you can make this ahead of time, take it with you wherever you go, and eat it nicely chilled. Note: if you’re making this for a crowd of more than 4-6 people, you might just want to save yourself the hassle and assemble it in one large dish and spoon out individual portions. Just make sure it’s deep, and ideally see-through, like a big glass bowl. Have fun with this dessert. It’s a little messy, in a great way, so don’t sweat the small stuff. It’s the best kind of baking. In a jar. This recipe has multiple components, although they’re all pretty easy to make. The cake and pudding (and whipped cream, for that matter) can be purchased or homemade up to 2 days in advance. I made everything myself, but that’s just cause I happened to have the time. I’ll leave that part up to you. 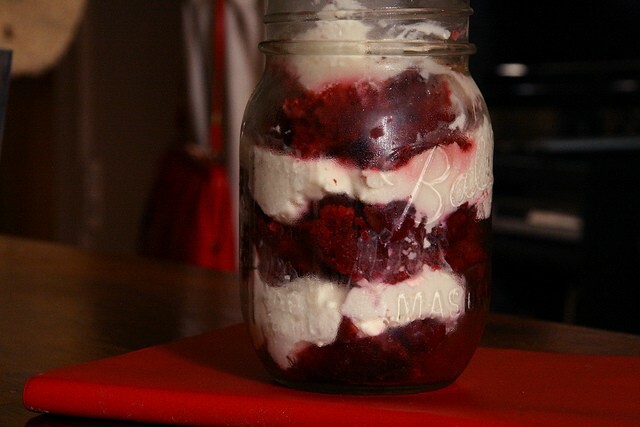 To assemble the trifle, simply plop and layer: Cube pieces of your cake and put them at the bottom of your jar. Drizzle about a half teaspoon of sherry on top (optional; otherwise, use another liquid to soften the cake, like cherry juice). Spoon some of the fruit on top and add a few dollops of the whipped cream. Repeat. At the top, spoon a layer of pudding after the fruit, and top with whipped cream. If you want more pudding, you can add it in the other layers as well. To gild the lily, top with a sprinkling of cocoa powder, a few cherries, some chocolate shavings, or a dash of cinnamon. Everything is to taste here. 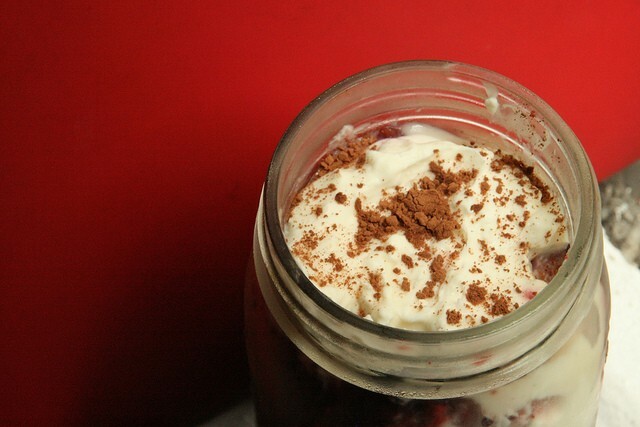 Easy as pie trifle. Preheat your oven to 350°. Grease an 8” square pan (or a 9” cake pan. It doesn’t matter since you’ll be cutting it up), and line with buttered parchment paper. Set aside. Whisk together flour, salt, and cocoa in a medium bowl; set aside. In a medium bowl, whisk (use electric beaters or stand mixer if you have one) sugar and oil on medium speed until combined. Add eggs one at a time; mix well after each addition. Mix in food coloring and vanilla. Add flour mixture in 3 batches, alternating with the buttermilk and beginning and ending with flour, mixing well after each addition. Scrape down sides of bowl as needed. Stir together baking soda and vinegar in a small bowl (it’ll fizz!). Add baking-soda mixture to batter, and mix on medium speed 10 seconds. Pour batter into prepared pan. Bake until a cake tester inserted into centers comes out clean, 40-50 minutes. Let cool completely in pans on wire racks. Combine water, sugar and lemon juice in heavy medium saucepan. Add vanilla (or scrape seeds from vanilla bean into saucepan; add bean), and a splash of sherry if you’re using it. Bring to a boil over high heat, stirring until the sugar dissolves. Boil until a thin syrup forms, about 7 minutes. makes…a lot. you’ll probably have extra. This makes something between a cream cheese frosting and whipped cream. Softer than frosting, sturdier than normal whipped cream, it served my purposes perfectly. Adapt as you wish for sweeter or tangier taste. 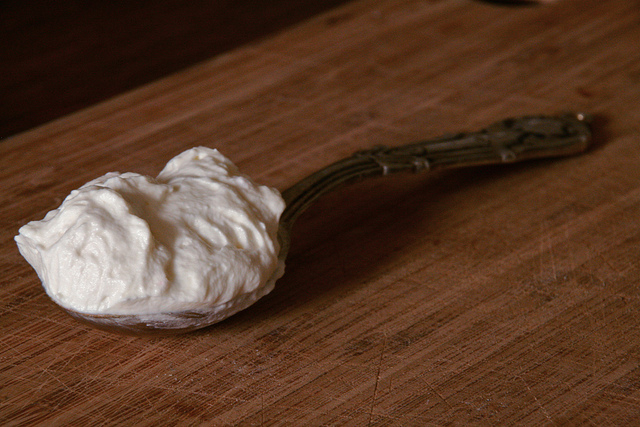 Beat the cream cheese in a medium bowl until it’s creamy, make sure all the lumps are gone. In a separate bowl, whip the cream until it’s just barely starting to come together–it should have very soft peaks that collapse. Scrape in the cream cheese, and add as much powdered sugar and vanilla as you wish. Continue to beat until it forms stiff peaks (try not to overbeat or this will taste like butter. Cream cheesy butter.). I LOVE TRIFLES!!! One of the reasons I love them is that they are so “oh this little thing? this can’t really be a damaging dessert, right? It’s just a wee little trifle!” And they are so. not. wee.